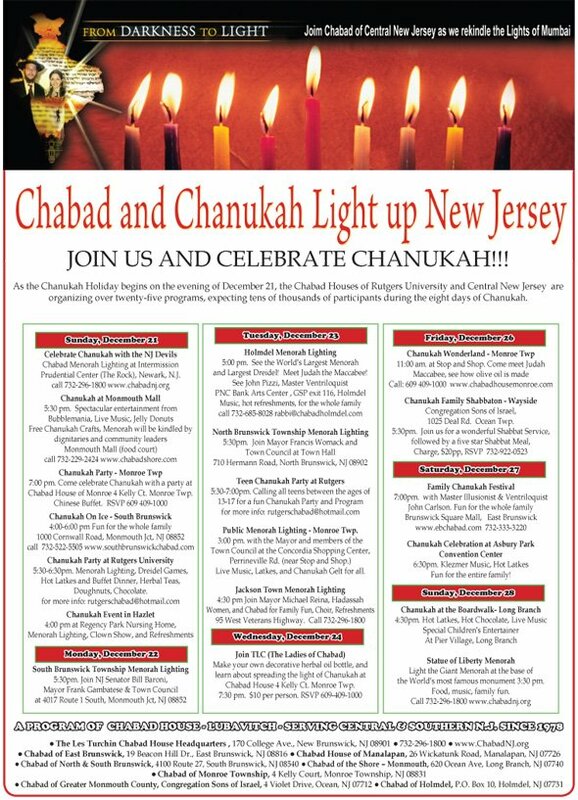 This years Chanukah promises to be a record breaker in the annals of Chabad House at Rutgers University and its affiliate Chabad Houses throughout central and southern New Jersey. 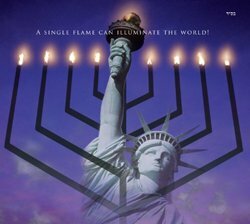 As the Chanukah Holiday begins on the evening of December 21, the Chabad House staff and its affiliates are organizing over twenty-five programs, designed to cater to more than one hundred thousand people during the eight days of Chanukah. 5:30 pm. Spectacular entertainment from Bubblemania, Live Music, Jelly Donuts. 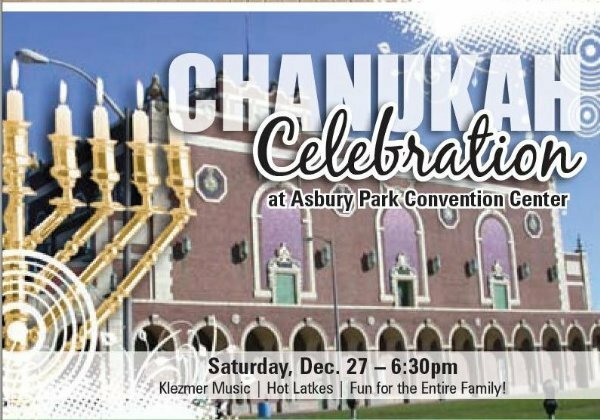 Free Chanukah Crafts, Menorah will be kindled by dignitaries and community leaders. 5:30-6:30pm. 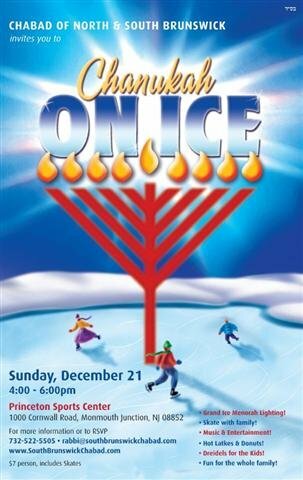 Menorah Lighting, Dreidel Games, Hot Latkes and Buffet Dinner, Herbal Teas, Doughnuts, Chocolate. 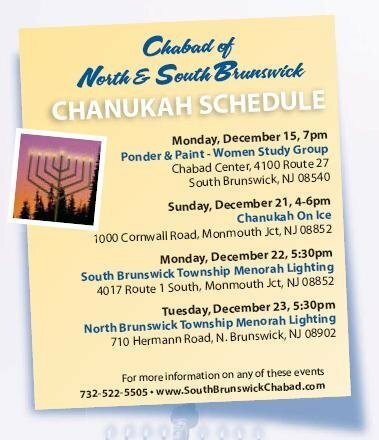 Public Menorah Lighting - Monroe Twp. 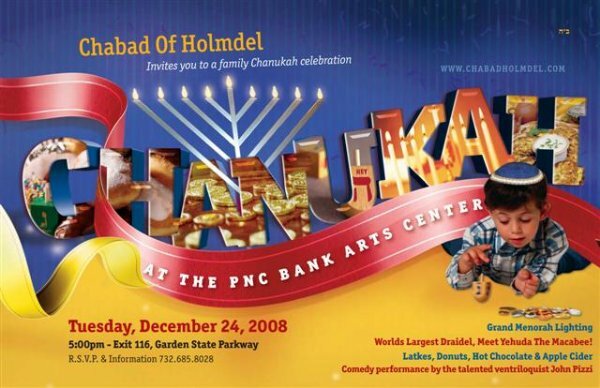 Live Music, Latkes, and Chanukah Gelt for all. 4:30 pm. 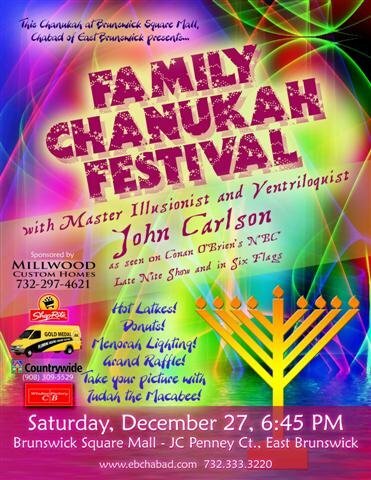 Enjoy a Chanukah celebration at your favorite mall! 3:30 pm. Food, music, family fun. 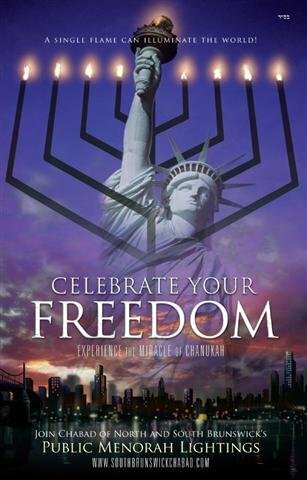 In addition to the above activities, Chabad House will distribute 400 gifts and toys to children in hospitals and the Chabad House volunteers will visit seven area hospitals and more than twenty-five nursing homes and senior citizen facilities during the eight days of Chanukah. 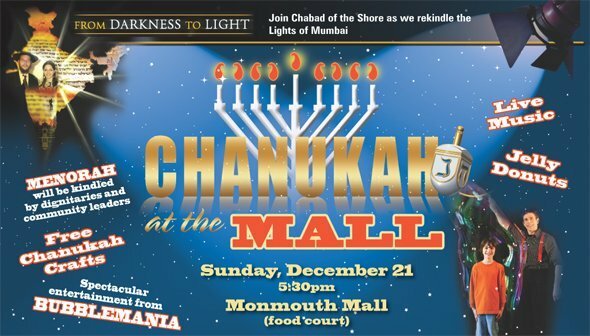 More than 100 public Menorahs will be lighted nightly in area city halls, shopping centers and office complexes. 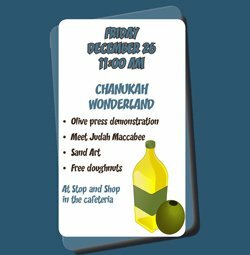 In preparation of the Chanukah activities, The Chabad House kitchen staff will be busy with the deep frying of over 18,000 steaming potato latkes, 6,000 jelly doughnuts and gallons of hot apple cider.